Seller will give you a gift certificate in the amount of 6,6358 RUB for a positive review of the product purchased. 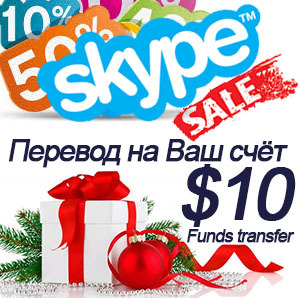 TOP UP Skype (funds transfer to balance) in the amount of 10 Usd. Is not immediate, the waiting time of the operator´s actions up to 24 hours. 1. After the payment you specify Skype login for funds transfer. 3. We will transfer the paid amount to you, 10 Usd. IT´S NOT A VOUCHER !!! AFTER PAYMENT YOU WILL NOT RECEIVE ANY CODE !!! ATTENTION! Please note that the transfer of funds is made manually and depends on the availability of the operator. From Monday to Friday, the operator is available late in the evening, on Saturday and Sunday - throughout the day. Therefore, if you did not receive the funds transfer as quickly as you expected, please patience, we will transfer. Seller will give you a gift certificate in the amount of 6,6358 RUB for a positive review of the product purchased..